The most exciting part of becoming a bride – the engagement ring! As 2011 has now met its end and a new “sparkling” year has begun, I thought it was the perfect time to ride the “bridal bandwagon” and talk about the most exciting part of becoming a bride – the engagement ring! Mind you, I didn’t say it was the most “important” part (wink) it is however, undoubtedly the most exciting part for the bride-to-be, as well as the element that kicks off all the planning, parties and celebration. Rather than recite all the diamond buying information that you can easily read online about choosing a jeweler and knowing all there is to know about the 4 C’s – cut, color, clarity and carat, I thought I would discuss trends in engagement ring styles and what’s new on the design scene. The biggest engagement ring trend right now, in part prompted by Kate Middleton and the famous sapphire and diamond ring once worn by Princess Diana, is the Sapphire engagement ring. More brides are thinking “colorfully” and whereas the classic white diamond will NEVER go out of style, the use of colored precious gems (especially rich blue sapphires) is definitely a trend on the rise. A compliment trend I really like is the “Halo Setting” which you often see paired with colored stones. Small diamonds encircle or frame the center stone, thus creating a “halo”. This style is reminiscent of vintage rings and is also a wonderful way to make the solitaire appear larger. Everything old is new again and this very much applies to engagement ring and wedding band trends. The ornate details of Victorian and Edwardian jewelry as well as Art Nouveau’s free-form curves and the glamorous architectural lines of Art Deco design are very much in demand when it comes to the most important piece of jewelry in a woman’s collection. Engagement rings such as these often have intricate metalwork and milgrain or filagree accents which up the dazzle factor. These styles also work extremely well with smaller solitaires as the meticulous detail adds substance and charm. As of late, Hollywood has been very obsessed with vintage styles and this always translates to what people ask for in the shoppe. Symbolizing the past, present and future – three stone engagement rings continue to be a top requested style, with many brides combining the colored stone trend and opting for a sapphire or emerald as the center stone. Three-stone engagement rings are a clever way to get more ring for your budget, as three smaller diamonds are often substantially less than one large one. The three-stone ring is perfect for the traditional girl who wants something just a little bit different. When a trend manages to stand the test of time, we must deem it a classic and so the traditional round solitaire holds this place. Still the most requested cut and popular style, many brides just want the simple elegance and statement that this style stands for. Settings however have come a long way from just prongs! Trends within settings is a whole other category, that have become cutting-edge and jaw dropping. From artsy tension settings to high-profile settings that reveal sculptural design and carved metal, a simple round solitaire can now be elevated to a design masterpiece. For those of you who have already had your big day but are looking to experience that wedding rush allover again, many women choose to upgrade or restyle their original ring. We work with many clients on custom designs that utilize the stone(s) from the original ring to maintain the sentimental value. The process can be as simple as choosing a pre-designed remount from one of our collections or creating an entirely one-of-a-kind design for the new ring. 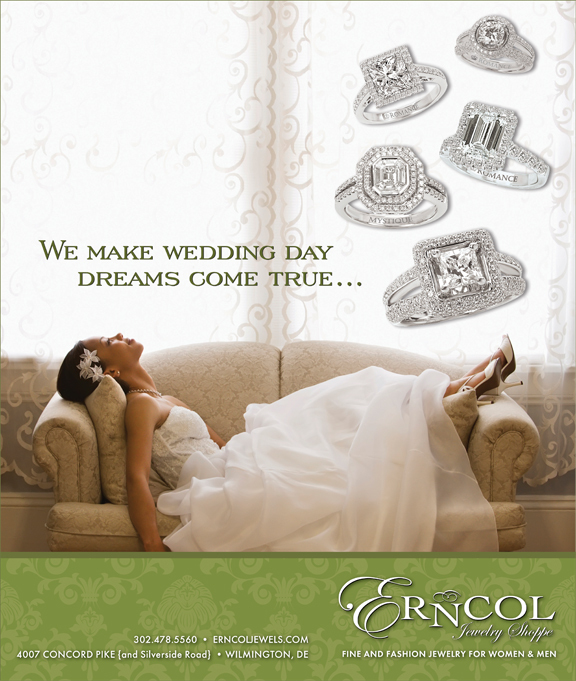 So, if you are hoping to get engaged this year or know a fine fella who is nervously about to begin his search, I invite you to stop into Erncol and just chat. There’s nothing that we love more than listening to your wants, wishes, and worries and somehow making sense of it all with a ring that makes your heart pound when you see it. ← Previous Story Your First Stop To a Great Vacation!